State of the paths is relative. Eastern ridge presents no protection evident in the first 3 lengths, the Hunters of the Mountain presents problems of orientation, belay station 6 of the Shadow Edge is done in friend. Access route: Coming down to the Keys, with about 200 meters before the tunnel is off to the left a road that crosses the Bicazul. Here, there was a few years ago the chalet Cheile Bicazului, completely destroyed in a fire. 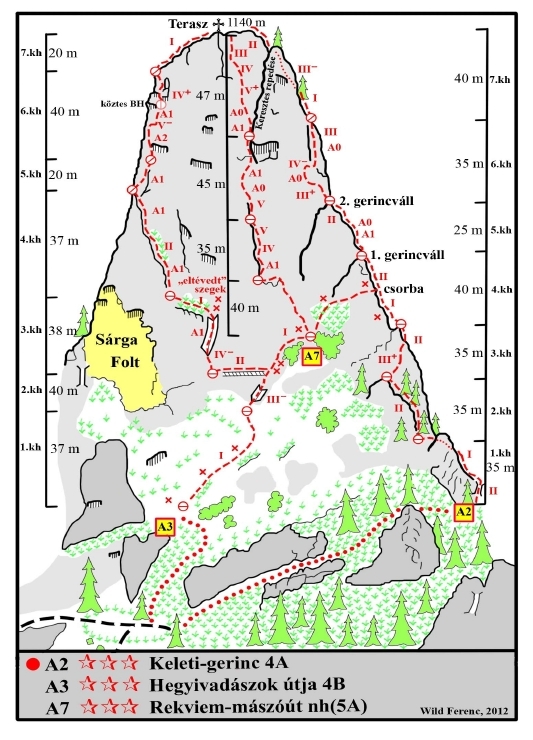 The trail (obvious and out of place in the place marked) run through the forest and after about 5 minutes down to the valley of lapos where through a place "arranged" pass on the other side. After another 10 minutes of climbing, they reach a tree that is painted an arrow that symbolizes a branch. To the left, going towards the entrances of the majority of the routes, and to the right towards the entrances of the Pillar and the North-Western and the Classic Route. Retreat route: All the trails end up on top. Here it is next to the descent in the reverse Route of the Classic (2-3 boosts in the of the chords which we have) and its entrance is continued downward until the branch point.